MAUNA LOA, Hawaii - The fire grew 474 acres yesterday to 3,679 acres and is estimated to be approximately 51 percent contained, the National Park Service says. (BIVN) – Fire crews battling the brush fire on Mauna Loa have thus far prevented it from spreading into the Kīpuka Kī Special Ecological Area in Hawaiʻi Volcanoes National Park, and reduced spread towards the Volcano Golf Course community, officials report. Hopes that Hurricane Hector might bring enough rain to the island to douse the fire were dashed when the storm’s pass to the far south of Hawaii produced only minimal precipitation yesterday.The fire grew 474 acres to 3,679 acres and is estimated to be approximately 51 percent contained. The cause of the fire, which started August 5 outside the park on Keauhou Ranch, is under investigation, the National Park Service says. 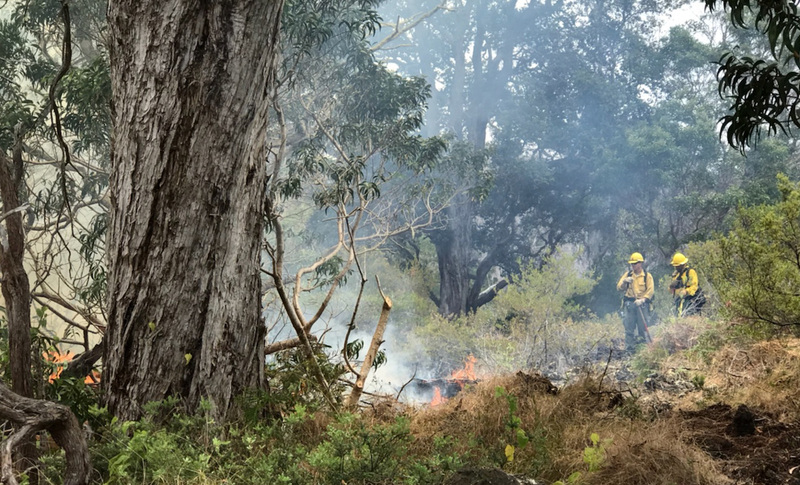 Joining in the effort to fight the fire are personnel from the National Park Service, Hawaiʻi County, State Division of Forestry and Wildlife (DOFAW) and volunteers from Volcano’s Company 19. This morning, an additional 21 firefighters from the Folsom Lake Veterans Crew out of Placerville, CA joined the efforts. On Friday, a Type II Incident Management Team from the mainland will arrive to help manage the fire, officials say. Kīpuka Kī is a treasured Special Ecological Area (SEA) for its natural and cultural resources. It is one of the rarest old-growth native forests of its kind in the world. Its towering ʻōhiʻa, koa and mānele trees are essential for the survival of threatened and endangered native plant and animal species. Unlike forests in other areas of the world, Hawaiian forests are not adapted to wildfire. The introduction of non-native grass and other plant species fuel fires that can quickly destroy centuries of growth.